Today I have a last minute Easter outfit to share with you all! If you're expecting and just not sure what to wear on Sunday (I get it...the struggle is real at this point), this cute + comfy maternity dress from Target is perfect for the occasion (online and in stores...only $24.99!). The periwinkle color is so pretty for Easter and other spring events and I love that you can dress it up or down! To style this dress for Easter, I dressed it up with strappy sandals and a light pink satchel. If it's chilly, I would throw on a white cardigan sweater or blazer! This adorable perforated satchel is also from Target and I purchased it a year ago. 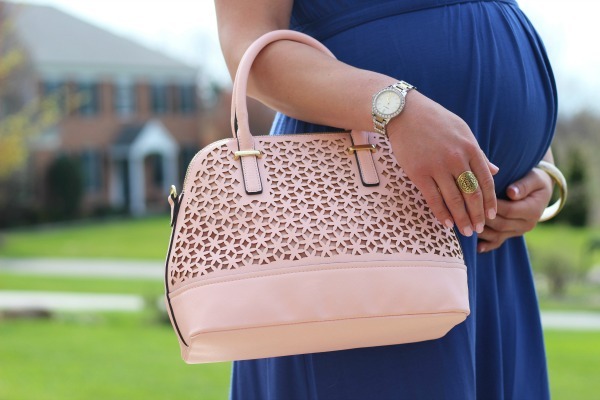 Blush and light pink bags are huge again this year, as well as the perforated style! Periwinkle and light pink are a chic and feminine springtime color combo. Kohl's has a very similar satchel by Jennifer Lopez (on sale for $52.32 with code BUYQUICK) or if you're in the market for a designer bag, this Kate Spade is GORGEOUS and this Henri Bendel is on major sale. 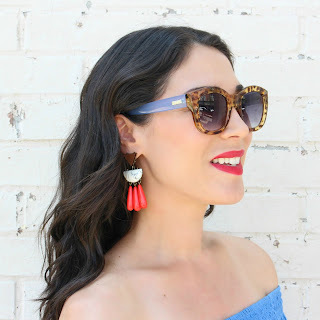 I accessorized with gold jewelry and my Le Specs tortoise/chambray sunglasses (love!). 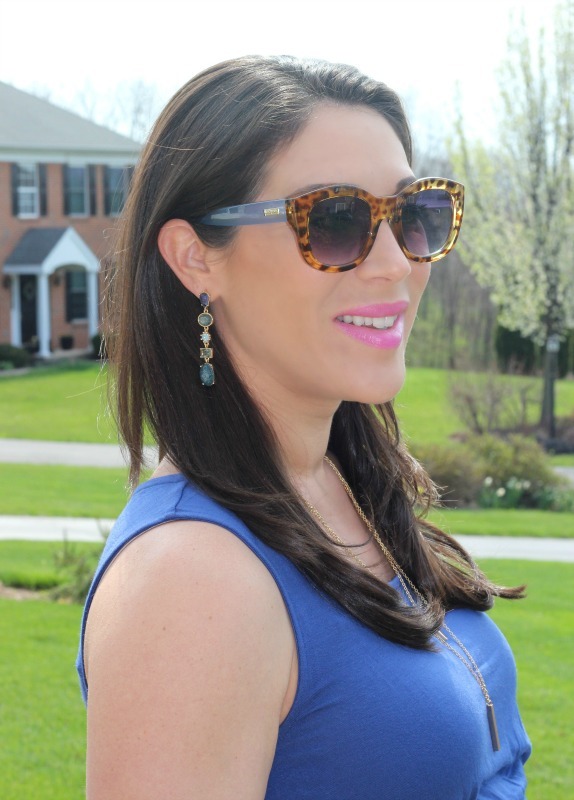 My blue drop earrings are from LOFT and are no longer online (meh) but any gold earrings work well with this dress. I'm loving layered gold necklaces lately and this one is from Baublebar. They have similar versions here ($36) and here ($16.99, Sugarfix by Baublebar). That looks so good on you! I got lots of maternity from Target they have good stuff! Gorgeous! That color with the pink is perfect. I. Ever think to pair those together! What a classic dress! And that's a piece you can dress up or dress down depending on what you are doing! So pretty.